This advanced overlock machine is easier to use and promises superior cost effectiveness. The Juki MO-6800S Series responds to various kinds of sewing materials and processes, producing delicate and beautiful soft-to-the-touch seams while further reducing operating noise as well as increasing durability. 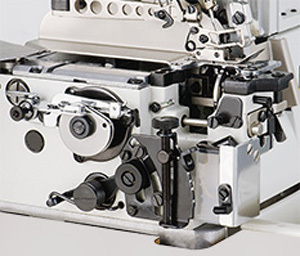 This advanced overlock machine is easier to use and promises superior cost-effectiveness as well as the responsiveness from light- to heavy-weight materials with a lower applied tension. The machine is widely applicable to the sewing of light- to heavy-weight materials. Since the machine is provided with a needle thread take-up mechanism and a looper thread take-up lever, it ensures high-quality, well-tensed and soft seams with a beautiful texture which flexibly correspond to the elasticity of the materials even when run at speeds as high as 7,000 sti/min. In addition, the machine has a wider and brighter needle entry and provides improved responsiveness to the materials, thereby helping the operator use the machine more easily. The optimally-balanced design of the machine reduces both operating noise and vibration, contributing to more comfortable sewing work.